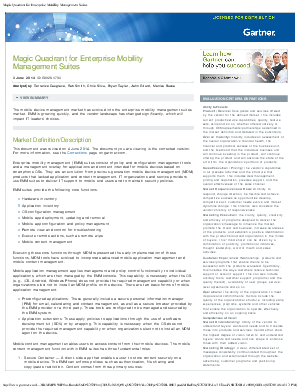 Every year Gartner evaluates the enterprise mobility management vendors on their completeness of vision and ability to execute. This criteria is used to place vendors into one of four quadrants. For the fourth consecutive year MobileIron has been placed in the Leaders quadrant. According to Gartner, "The hallmark of leaders is that they focus and invest in their offerings to the point that they lead the market and can affect its overall direction."